Today’s more competitive environment, full of noise and with high consumer expectations of seamless omnichannel interactions, demands that you personalize more in order to stand out, delight your consumers, and earn their business. 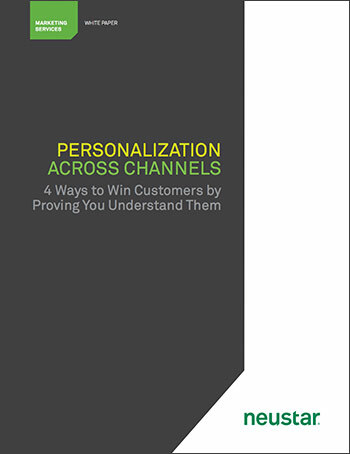 In this white paper, we’ll discuss why your consumers feel like you don’t understand them and offer four strategies you can employ now to amp up your personalization strategy. Even though website personalization has showed solid returns since the early days of the web, the most commonly used techniques only have an impact on a small fraction of people who visit your site. If you’re only personalizing to visitors who have logged into your site, you’re losing opportunities to get to know 98 percent or more of your visitors; research shows that only 0.85 percent6 to 2 percent7 of visitors actually log in. Personalizing against 2 percent of your site visitors is a great start, but you can’t count on it to help consumers feel understood. Some referral URLs may give you a bit of insight into your visitors’ intent, but many visitors reach your site from sites that are completely unrelated to yours. Furthermore, referring URLs tell you nothing about a visitor’s demographic characteristics, preferences, or propensity to purchase, making it difficult to create personalized content. On-site behavioral targeting for unknown, unauthenticated visitors takes several clicks before it starts to become effective. But it takes less than two-tenths of a second for an online visitor to form a first opinion of your brand and just another 2.6 seconds for that viewer’s eyes to concentrate in a way that reinforces that first impression.8 The first 10-20 seconds are critical in visitors’ decisions to bounce or stay.9 Unless you’re personalizing from the moment that a visitor lands on your site, your visitor may bounce before your site shows that it can learn how to be relevant. Many companies assume that A/B testing is the best approach for optimizing the initial experience for the unauthenticated majority. But A/B testing does not actually help you develop a more relevant experience for each visitor. It relies upon you making a guess (on what the best content is) against a guess (who is really seeing that content). That’s why the benefits of A/B testing plateau so quickly. Establish a listening period to compile baseline data on how your best customers behave on your site. In addition to your web analytics, you’ll need solutions for segmenting and modeling these customers. Use the insights gained during the listening period, along with other first, second, and third-party data, to segment your customers based on their interests and buying behavior. Work with a provider that uses an authoritative identity methodology to resolve each visitor as a real person (not a bot) in real time and provide your personalization engine with a privacy-friendly, context-rich profile that maps the visitor to your key buyer personas. Serve the messaging and offers that are most meaningful to that person in real time, as soon as he or she lands on your site. On any given day, 50-70 percent of cookies used by ad networks are being seen for the first time10 and thus provide no historical insight. Over the course of a month, more than 80 percent of ad network cookies are seen on only one day,11 making it more difficult to piece together associations to build that single customer view. iOS devices are set to limit ad tracking by default. Effective targeting and efficient media buys involve deeply understanding your consumer—both who is likely to and who is not likely to convert. This requires looking at a range of demographic, psychographic, lifestyle, attitudinal, and buying data. The data in cookies and mobile advertising IDs have little predictive value. And because they rarely persist over long periods, they can’t tell you how much a consumer has been exposed to your brand. Any modeling you do to better understand your customers must be actionable if it is going to have an impact on your campaigns. Too many segmentation frameworks can’t get past the theoretical because there is no way to purchase them as audiences or use them for site personalization. Traditional DMPs and website analytics offer segmentation based on digital behaviors (such as sites visited or mobile apps downloaded) to build an understanding of the consumer. This data can be useful, but it can give you a very skewed picture of the person you’re trying to reach. And once you do reach your target customer, how do you know what has been effective? Without a common framework that resolves visitors across channels and devices, you won’t be able to measure interactions or understand the full path to conversion. Engage in a “listening period,” using first- and third-party demographic, psychographic, lifestyle, attitudinal, or buying preference data to understand who your best customers are. Make sure that you incorporate both online and offline activities for a more complete customer model. Use audience data from your listening period to find look-alikes of your best-performing customers. Now that you know who your best customers are, you want to find more people like them online. But you also need to find out which segments are not interested and stop targeting them. You won’t want to waste your limited media budget on people who will never convert. Consider techniques like sequential messaging to tailor messages to stages in the customer journey. To do this, you need a consistent way of reaching an individual consumer no matter where he or she is online or offline. Measure success by looking at both online and offline channels, using an authoritative identity methodology to connect activities in disparate channels. For example, a retailer needs to understand the impact that its digital and mobile campaigns have on in-store sales, not just on e-commerce. Does it ever seem like online ads are following you around? And to add insult to injury, how often do these ads feel completely generic? Or advertise something you already purchased? Remarketing can make online advertising much more effective, but you aren’t doing your consumers any favors if you don’t try to learn about them and instead personalize only based on the URLs they have visited. Reach out only to people who will care about your message, either because they have expressed interest or because they belong to a segment with a propensity to buy your products and services. Propensity is indicated by past online and offline behavior and advanced segmentation, not by one visit to a product page. Deliver your messages at the right time in the customer lifecycle, when they are more likely to earn consumers’ attention based on their typical purchase patterns. For example, remarketing windows for an item like a laptop may be shorter than those for a new automobile. Tailor your messages to the known relationship you have with each consumer. As the simplest example, don’t deliver a sign-up offer to an existing customer. An authoritative identity methodology that’s built with privacy in mind can recognize different types of relationships while conforming to your privacy policies. Use a segmentation framework that incorporates insights from online and offline sources. In addition to third-party data, incorporate first-party data from your CRM and other marketing technologies into your remarketing programs, so that you can more effectively reach people you already know. Execute remarketing consistently across online and offline channels. Use the same insights to shape personalized offers through the web, mobile, direct mail, and the call center. When a consumer closes her web browser and dials your call center, she may feel like she’s landing on a different planet. Unless she already completed a transaction, your call center staff probably has no visibility into the actions that she took online and will treat her like a brand new customer. Most call centers don’t see data capture as a revenue-generating activity, so agents may not ask callers for additional contact information that you could use later for email or direct mail follow-ups. Likewise, most companies fail to treat the precious data in their interactive voice response (IVR) systems as lead sources because a) it never occurred to them or b) they lack the means to connect a phone number with a caller’s name and address. Some consumers respond best to phone calls, others to direct mail, and others to email. Ideally, brands would optimize channels based on consumer preference, but too often they lack enough information to exercise options. And in cases where you have only a phone number, the Do Not Call list may eliminate your only channel of communication. Append your CRM data with the consumer’s phone number so your agents understand that this is a person with whom you have interacted in the past. Use not only purchase history but also other first- and third-party data to understand the affinities a caller has with your best customers and to map her into your key audience segments. Provide call center agents with the offers that are most likely to resonate based on your deeper understanding of the person at the other end of the line. Neustar solutions fuel the real-time intelligence that your execution engines need to understand both known and unknown consumers and serve them with a personalized, meaningful experience in any channel. Neustar makes it possible to marry your own first-party data with rich third-party information, generate true predictive segmentation, bring these context-rich profiles into online and offline channels, and deliver the right message to the right consumer at the right time. Neustar arms you with the five key ingredients that make omnichannel personalization possible at scale. Neustar gives you a way to supplement real-time interaction data with any data that helps you better understand your consumers: your first-party data, second-party data from trusted providers, and third-party data from service providers. You can build rich audience profiles that mirror your best customers, using more than 15,000 online and offline attributes linked to validated authoritative demographic, psychographic, and behavioral data. Effective omnichannel personalization requires regular inputs from all of your online and offline sources in order to stay relevant over time. You also need a critical mass of interactions for accurate performance measurement. Collecting this data across your business and your vendor ecosystem requires neutrality—an unbiased view of who your audiences are and how they’re behaving. A provider who is also selling media and advertising may have real or perceived conflicts of interest with other providers in the ecosystem, preventing them from collecting a robust dataset. At Neustar, we have built our entire solutions portfolio with neutrality as a key premise. Omnichannel personalization demands that multiple execution engines work in concert with each other: your CRM, website platform and/or optimization engine, email system, ad servers, and even direct mail or call center solutions. You also need to integrate inputs from offline channels into your measurement systems since consumer behavior is fundamentally omnichannel. An effective personalization hub will be able to fuel all of these touchpoints with consistent audience data—in real-time. This is the only way to keep messaging and offers both relevant and fresh. Cross-channel measurement is the key to being both effective and efficient with every campaign. With Neustar Identity, you gain a full picture of activity across all consumer touchpoints, both online and offline, allowing for multi-touch attribution and closed loop analysis. You may be thinking about personalization in the context of a single dataset that you can use to optimize interactions in a single channel. You may have even structured your organization and your technology stack with this single-channel approach in mind. But because consumers are increasingly omnichannel, your personalization needs to be omnichannel, too.